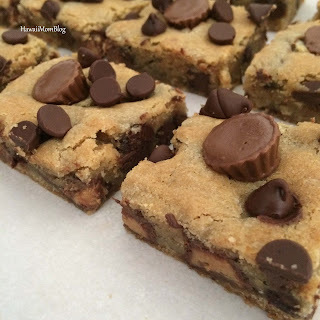 Since I was meeting a friend for lunch one day recently, and I know how much she loves Reese's Peanut Butter Cups (almost as much as I do), I decided to make these Reese's Peanut Butter Cup Minis Cookie Bars for her. They are super easy to make - just take your favorite chocolate chip cookie recipe (for this recipe I used the Original Nestle Toll House Chocolate Chip Cookie recipe), and instead of 2 cups of chocolate chips, I used only 1 cup + 1 cup of Reese's Peanut Butter Cup Minis. I baked at 350 degrees Fahrenheit in a 9x13 pan for approximately 25 minutes. As soon as they were done I simply placed more Mini Reese's and Chocolate Chips on top. If you love Reese's PB Cups, this is a must-try recipe! I got to make this for the husband!! He loves Reese's!